Yogyakarta (pronounced as Jogjakarta) or better known as Jogja has always been on my checklist. Before I visited Yogyakarta, I only knew about Prambanan and Borobudur for its famous historical stories. However, my trip in March 2017 proves that Jogja has more than just history to offer us. Yogyakarta is located in central Java. The Javanese culture and language are purest here. Thus, Jogja is often referred as the soul and heart of Indonesia. It may be a big city but it is more laidback than most cities I have visited. Surprisingly to you, it is even more laidback and relaxing than Bali. This ancient city reveals its beauty to its visitors even when you walk past the alleyways. You will be welcomed by friendly locals, great food, and streets arts on the walls. In this first part of the write-up, I will be focusing on all the cultural sites that need to be visited in Jogja. In the 2nd article, it is about the adventures of Jogja such as caving and their beautiful beaches. Why 2 parts of the same city? Because this city is huge and there is just too much to talk about! Each of these places leaves a deep impression on me. Ullen Sentalu has been voted as the best museum in Indonesia by National Geographic for a couple of years now. It was one of the best experiences that I have ever had in my life too. I am amazed by how clean and well-managed this private museum is. This is definitely a must visit when you are in Yogyakarta. Located in East Kaliurung region near Mt. Merapi, it takes about 45-60 minutes scooter ride. Beautiful village sceneries and cool air on the way up. However, traffic towards Kaliurung region from Jogja town can be quite slow and roads are dusty. If you are planning to take taxi or GrabCar, it would cost about 80-100,000 IDR one way. You will find limited photos of this museum due to its strict rules and regulations on photography. With the admission ticket, you can choose to either tour the museum on your own which is not the best or wait for a guide. The guided tour is either in English or Indonesian language and is only available every 30 minutes. To avoid being in a crowded group, go either early in the morning or at 3 pm before they close. 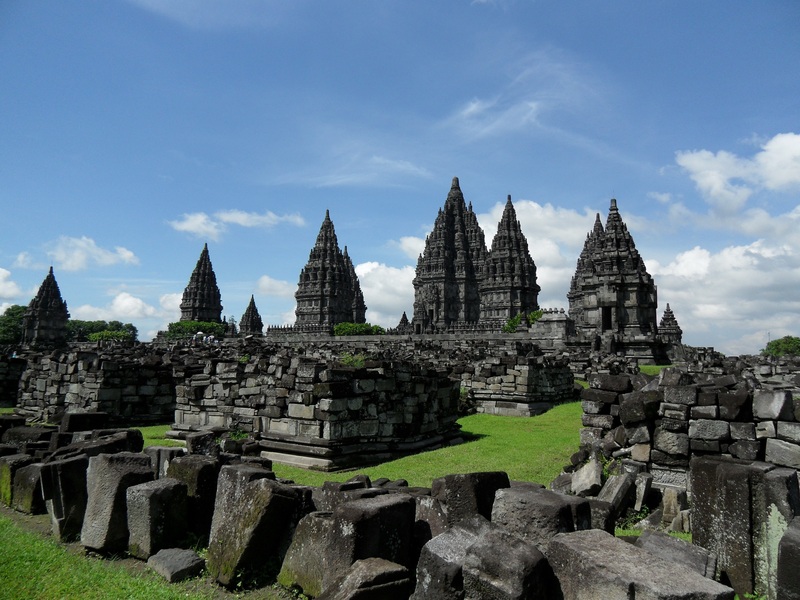 According to UNESCO, Prambanan is the largest temple compound in Indonesia dedicated to Shiva, a Hindu God, that was built in the 10th century. This sentence itself tells you that this is a must visit. There is no way you can skip Prambanan. Besides, it is only 30 minutes from city centre and is probably the best place for sunset. This is the sunset view of Prambanan with very little editing on lighting. The photo was taken with a Samsung Galaxy Note 5. Its compound consists of 3 main temples devoted to the Shiva, Vishnu and Siva. They are the 3 main Hindu gods in the Ramayana epic. You will also notice 3 smaller sized temples for the animals that have served these gods. These 6 temples that you must visit are simply part of the 240 temples that are in the same compound. Most of the other temples are either in total ruins or in construction when I visited Prambanan this year. Prambanan + Plaosan + Sojiwan : USD30. Did you know that Borobudur is the world’s largest (2,500 sqm) Buddhist temple? It was once buried and lost due to the earthquake but Dutch colonizers found and restored the temple grounds. Today, it stands tall once again as a 9 storey stacked temple as one of the 7 wonders of the world. Other than being the largest Buddhist temple in the world, it is also the most visited place in Indonesia (which I initially assumed that to be Bali). Borobudur is also one of the best places for sunrises if you are not into hiking mountains. You will find a Buddha statue in each and every one of the small stupas. “The vertical division of Borobudur Temple into base, body, and superstructure perfectly accords with the conception of the Universe in Buddhist cosmology. It is believed that the universe is divided into three superimposing spheres, kamadhatu, rupadhatu, and arupadhatu, representing respectively the sphere of desires where we are bound to our desires, the sphere of forms where we abandon our desires but are still bound to name and form, and the sphere of formlessness where there is no longer either name or form. At Borobudur Temple, the kamadhatu is represented by the base, the rupadhatu by the five square terraces, and the arupadhatu by the three circular platforms as well as the big stupa. The whole structure shows a unique blending of the very central ideas of ancestor worship, related to the idea of a terraced mountain, combined with the Buddhist concept of attaining Nirvana. If you have not heard about it, Borobudur’s sunrise is not to be missed and the combo ticket as mentioned under Prambanan do not include sunrise hour. Sunrise Borobudur via Manohara Resort : IDR450k. Borobudur + Mendut + Pawon : USD30. This water castle is not exactly made of water or built on water. It is actually the pleasure park encompassed with waterways and pools for royalties and entourages. This water castle may seem far from the Keraton but in actual truth, it is just a few streets away. If you are wondering what do I mean by pleasure park and thinking about 50 shades of Grey, that is not what I meant. Taman Sari was the place where maidens of the land would go to play and swim in to gain the attention of the Sultan. The chosen maidens will then be groomed and taught to be proper wives to the Sultan. Sounds bad in this era but back then, it was a privilege for women to marry the Sultan. Plus, this selection process is not meant to be for fun. It was for an actual lasting marriage that brings fame, power and richness to the maidens and their families. Frankly speaking, there is nothing much to see at Ratu Boko as the place is almost 80%-90% ruined. I have no idea when it will all be rebuilt but for the time being, you can unleash your imagination in this ancient ruin. With a little imagination, you can definitely be able to see how humongous and magnificent the old palace used to be! The best time to visit this ruin would be during sunset. During my trip, it was cloudy and thus, we missed the sunset. So, before you decide to visit Ratu Boko, please do check the weather in Jogja. After the rain or on a sunny day would be great. Plus, I noticed there were locals picnicking there. They bring their own garbage bags to clean the aftermath. I would say that is a smart move and I applaud them for thinking about the environment. During my visit, we were given drinks and food coupon for the Boko Restaurant which is in the same compound to enjoy the sunset and Mt. Merapi view. Not sure if we were just lucky or that is the actual ongoing package. If you have a tight schedule or budget, this could be one of the places that you might just skip. For me, it was worth the trip only because my imagination is amazing. Hahaha… I do sincerely hope that the government of Yogyakarta would soon reinstate its old glory just like how they are rebuilding Prambanan. This is the actual scenery you will get if you were to go during the peak season. Otherwise, great sunset view if it is not cloudy. Locally known as Benteng Vredeburg (Peace Fort) in Yogyakarta, this museum is bigger than it looks. It is located right in the middle of the city and easily accessible. It was once the fortress built by Dutch colonialists that were built in 1760 with the original name Fort Rustenburg (Resting Fort). The original fort was later destroyed by an earthquake in 1867. When it was rebuilt, this fort was converted to be a Struggle Museum in 1992. Miniature showed in the exhibition. We accidentally stumbled upon this museum as we were walking around to discover the city. Boy, were we really glad that we decided to just walk in and take a look. It was the best place to learn about Jogja as it shows dioramas depicting historical events that have happened as early as 1830. The museum is well organized and there were interactive games that can be played throughout the exhibition. I believe this is an underrated museum that tourists should really visit to learn about the founding of Muhammadiyah to the guerrilla wars that had occurred. If you are visiting Jogja but do not visit the Kraton, I have no idea what you are doing there. It is not a fascinating place in Jogja but it is definitely a must visit to understand the culture. It is located near Ratu Boko and some other temples. Prince Mankubumi built this Kraton in 1755 and it was completed almost a year later. Way back then, the palace grounds were actually a Banyan Forest that helped to avoid flooding from the 2 rivers. However, this palace has gone through many turmoils such as attacks from the British empire, earthquakes and looting. Other than the historical aspect that you will learn, you will also be entertained by free live performances. If you love culture, history and arts, Yogyakarta (Jogja) is a must visit when you are in South East Asia. Click here to read the 2nd part of Yogyakarta where I wrote about its adventure sites.